Yesterday at AWS Re:Invent, Amazon Web Services, Inc. (AWS) announced five new machine learning services and a deep learning-enabled wireless video camera for developers. Amazon SageMaker is a fully-managed service for developers and data scientists to build, train, deploy and manage their own machine learning models. 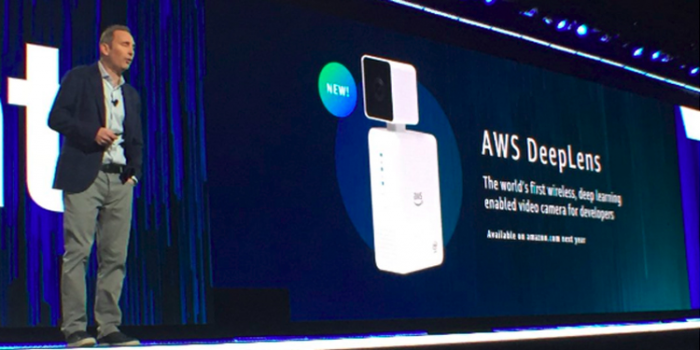 The company also introduced AWS DeepLens, a deep learning-enabled wireless video camera that can run real-time computer vision models to give developers hands-on experience with machine learning. And, AWS announced four new application services that allow developers to build applications that emulate human-like cognition. Today, implementing machine learning is complex, involves a great deal of trial and error and requires specialized skills. Developers and data scientists must first visualize, transform and pre-process data to get it into a format that an algorithm can use to train a model. Even simple models can require massive amounts of compute power and time to train, and companies may need to hire dedicated teams to manage training environments that span multiple GPU-enabled servers. All of the phases of training a model — from choosing and optimizing an algorithm, to tuning the millions of parameters that impact the model’s accuracy — involve manual effort and guesswork. Then, deploying a trained model within an application requires a different set of specialized skills in application design and distributed systems. As data sets and variables grow, customers have to repeat this process again and again as models become outdated and need to be continuously retrained to learn and evolve from new information. All of this takes a lot of specialized expertise, access to massive amounts of compute power and storage and a great deal of time. To date, machine learning has been out of reach for most developers. Amazon says SageMaker is a fully-managed service that removes the heavy lifting and guesswork from each step of the machine learning process. It makes model building and training easier by providing pre-built development notebooks, popular machine learning algorithms optimized for petabyte-scale datasets and automatic model tuning. Amazon claims SageMaker also simplifies and accelerates the training process, automatically provisioning and managing the infrastructure to both train models and run inference to make predictions using these models. AWS DeepLens was designed to help developers get hands-on experience in building, training and deploying models by pairing a physical device with a broad set of tutorials, examples, source code and integration with familiar AWS services to support learning and experimentation. “Our original vision for AWS was to enable any individual in his or her dorm room or garage to have access to the same technology, tools, scale and cost structure as the largest companies in the world. Our vision for machine learning is no different,” said Swami Sivasubramanian, VP of Machine Learning, AWS. Easily build machine learning models with performance-optimized algorithms: SageMaker is a fully-managed machine learning notebook environment for developers to explore and visualize data they have stored in Amazon Simple Storage Service (Amazon S3) and transform it using all of the popular libraries, frameworks, and interfaces. SageMaker includes 10 of the most common deep learning algorithms (e.g. k-means clustering, factorization machines, linear regression and principal component analysis). Developers choose an algorithm and specify their data source, and SageMaker installs and configures the underlying drivers and frameworks. SageMaker includes native integration with TensorFlow and Apache MXNet with additional framework support reported as coming soon. Developers can also specify any framework and algorithm they choose by uploading them into a container on the Amazon EC2 Container Registry. Experience fast, fully-managed training: Select the type and quantity of Amazon EC2 instances and specify the location of their data. SageMaker sets up the distributed compute cluster, performs the training, outputs the result to Amazon S3 and tears down the cluster when complete. SageMaker can automatically tune models with hyper-parameter optimization, adjusting thousands of different combinations of algorithm parameters to arrive at the most accurate predictions. Deploy models into production: SageMaker takes care of launching instances, deploying the model and setting up a secure HTTPS end-point for the application to achieve high throughput and low-latency predictions, as well as auto-scaling Amazon EC2 instances across multiple availability zones (AZs). It also provides native support for A/B testing. Once in production, SageMaker aims to eliminate the heavy lifting involved in managing machine learning infrastructure, performing health checks, applying security patches and conducting other routine maintenance. Get machine learning experience: AWS DeepLens is a fully-programmable video camera designed to put deep learning into the hands of any developer. It includes a HD video camera with on-board compute capable of running deep learning computer vision models in real-time. The hardware, capable of running over 100 billion deep learning operations per second, comes with sample projects, example code and pre-trained models so developers with no machine learning experience can run their first deep learning model in less than 10 minutes. Developers can extend these tutorials to create their own custom, deep learning-powered projects with AWS Lambda functions. For example, AWS DeepLens could be programmed to recognize the numbers on a license plate and trigger a home automation system to open a garage door, or AWS DeepLens could recognize when the dog is on the couch and send a text to its owner. Train models in the cloud and deploy them to AWS DeepLens: Developers can train their models in the cloud with Amazon SageMaker and then deploy them to AWS DeepLens in the AWS Management Console. The camera runs the models, in real time, on the device. “We’ve deepened our relationship with AWS, adding them as an Official Technology Provider of the NFL and are excited to use Amazon SageMaker for our next-generation stats initiative,” said Michelle McKenna-Doyle, SVP and CIO, National Football League. DigitalGlobe, provider of high-resolution Earth imagery, data and analysis, works with enormous amounts of data every day. “[We are] making it easier for people to find, access and run compute against our 100PB image library which is stored in the AWS cloud in order to apply deep learning to satellite imagery,” said Dr. Walter Scott, Chief Technology Officer of Maxar Technologies and founder of DigitalGlobe. “We plan to use Amazon SageMaker to train models against petabytes of earth observation imagery datasets using hosted Jupyter notebooks, so DigitalGlobe's Geospatial Big Data Platform (GBDX) users can just push a button, create a model and deploy it all within one scalable distributed environment at scale,” said Scott. For those developers who are not experts in machine learning, but are interested in using these technologies to build a new class of apps that exhibit human-like intelligence, Amazon Transcribe, Amazon Translate, Amazon Comprehend and Amazon Rekognition video aim to provide high-quality, high-accuracy machine learning services that are scalable and cost-effective. Transcribe (available in preview) converts speech to text, allowing developers to turn audio files stored in Amazon S3 into accurate, fully-punctuated text. Transcribe can generate a time stamp for every word so that developers can precisely align the text with the source file. Today, it supports English and Spanish with more languages to follow. In the coming months, Amazon says Transcribe will have the ability to recognize multiple speakers in an audio file and will also allow developers to upload custom vocabulary for more accurate transcription for those words. Translate (available in preview) uses neural machine translation techniques to provide translation of text from one language to another. Translate can translate short or long-form text and supports translation between English and six other languages (Arabic, French, German, Portuguese, Simplified Chinese and Spanish), with more slated in 2018. Comprehend (available today) can understand natural language text from documents, social network posts, articles or other textual data stored in AWS. Comprehend uses deep learning techniques to identify text entities (e.g. people, places, dates, organizations), the language the text is written in, the sentiment expressed in the text and key phrases with concepts and adjectives, such as ‘beautiful,’ ‘warm,’ or ‘sunny.’ Comprehend has been trained on a range of datasets, including product descriptions and customer reviews from Amazon.com, to build language models that extract key insights from text. It also has a topic modeling capability that helps applications extract common topics from a corpus of documents. Comprehend integrates with AWS Glue to enable analytics of text data stored in Amazon S3 and other popular Amazon data sources. Rekognition Video (available today) can track people, detect activities and recognize objects, faces, celebrities and inappropriate content in millions of videos stored in Amazon S3. It also provides real-time facial recognition across millions of faces for live stream videos. Rekognition Video’s API is powered by computer vision models that are trained to detect thousands of objects and activities and extract motion-based context from both live video streams and video content stored in Amazon S3. Rekognition Video can automatically tag specific sections of video with labels and locations (e.g. beach, sun, child), detect activities (e.g. running, jumping, swimming), detect, recognize and analyze faces and track multiple people, even if they are partially hidden from view in the video.